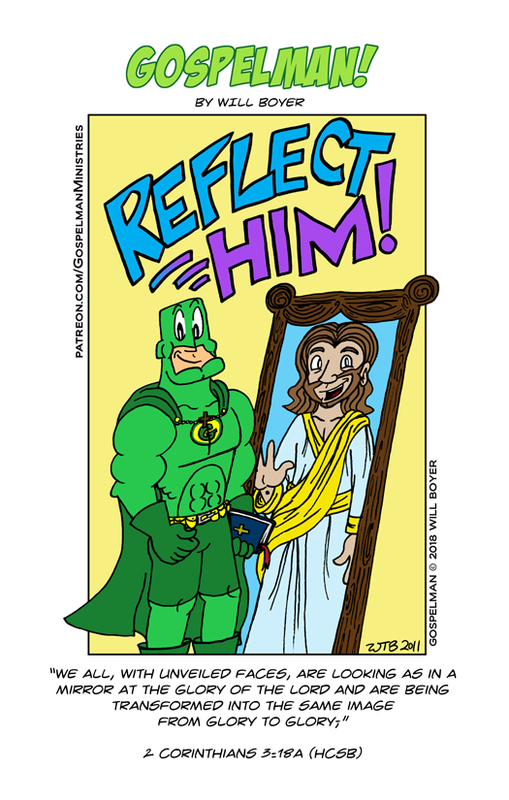 Gospelman the Strip - Reflect Him! Comic 7 - Reflect Him! Here's today's Creator Commentary! I was excited to upload this comic strip! This was originally meant to be strip #5! Originally drawn in 2011, I was waiting until I had time to correct the line art and color it. While I was at it, I took the liberty of editing Gospelman to look like his final design, pronounced chin and Gospel Utility Belt and all. I hope you like it, Gospel Chums! While I was at it, I update several of the older strips to include the Gospel Utility Belt. If you read back in the archive, you will eventually see the updated images instead of the originals. So, what is a "Gospel Chum," anyway? I've been saying this a lot, kind of like the official greeting on the Gospelman websites. This is inspired by Adam West era Batman's use of the phrase, "Old Chum," towards Robin. Gospelman is based somewhat on this era of Batman, the Bright Knight and not the dark, brooding knight. A chum is a friend. So, what is a Gospel chum? A Gospel chum is a fellow Gospel believer, a brother or sister in Christ! It also denotes being a fan of the Gospelman comics, much as "Ghosthead" or "Webhead" might be what you call a fan of the Ghostbusters or of Spiderman. Or of Spiderman himself, honestly! The more you know.